Graduate student Gillian Smith demonstrated Tanagra, a design tool her team created for computer game developers. More than 250 people from the game industry and academia attended the event at the India Community Center in Milpitas, which featured speeches interspersed with engaging sessions on games and cinema, speaking characters, authoring tools, and games and the future of culture. 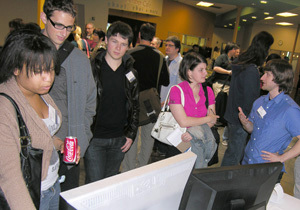 The symposium was sponsored by the UC Santa Cruz Center for Games and Playable Media. Will Wright (The Sims), Rod Humble (Second Life) and Michael Mateas (UCSC, Facade) joined session participants Jordan Mechner (Prince of Persia), Emily Short (Galatea), Tracy Fullerton (USC, The Night Journey), Chris Crawford (Balance of Power), Graeme Devine (7th Guest), Ian Bogost (Georgia Tech, Cow Clicker), Chaim Gingold (Spore), Robin Hunicke (BOOM BLOX), and UCSC computer science professors Noah Wardrip-Fruin, Arnav Jhala, Marilyn Walker, and Jim Whitehead in speaking at the event. 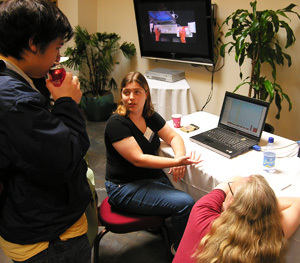 Guests got a look at what research in games looks like at UC Santa Cruz as they browsed graduate students' technology demonstration projects, which lined the lobby. After an introduction by Art Ramirez, dean of the Baskin School of Engineering, UCSC Chancellor George Blumenthal started off the symposium by speaking briefly on the role of university research in game design. "All of the early games had one thing in common--they came out of research universities and national labs," Blumenthal said, adding later, "UCSC is committed to forward-looking technologies." It was a theme expanded on by Mateas, associate professor of computer science and director of the Center for Games and Playable Media, in his opening address. Mateas pointed to the innovations other academic fields have contributed to their industry counterparts--from better solar panels to the invention of the Internet. "In industry, games research is an oxymoron," he said. "The only value is to work on something shipping soon. Games are media, so progress is made by creating things to be experienced." Mateas explained that his goal is to bring forward the field of computational media, which creates "new tools and approaches that allow you to make games that you couldn't even think of today." Currently, more universities focus on game studies and design research. "You can't make the Mona Lisa if you only have broken crayons," Mateas said. "You need different tools." Speaking of art, in a speech on apocryphal game design problems, Linden Labs's Humble said debate about whether games are art has finally been put to rest. Linden Labs runs the virtual world Second Life. "That's an amazing victory," he exclaimed. "I thought this was going to be the struggle of our lives." However, he cautioned that becoming a massive art form creates a need for game designers to be responsible. "I think that games can change human behavior," he said. "I've played games that have changed my entire outlook on life." Wright, creator of The Sims and Spore, also spoke of games as life-changers, pointing out that we start our lives as children playing games to help us explore and understand reality. The head of game think tank Stupid Fun Club, Wright returned to the idea--first mentioned by Ramirez in his opening comments--that being interdisciplinary is important to the future of games. "All of the really interesting trends in entertainment are in the intersections," he said, adding that he likes to think of it as "interdisciplinary entertainment." Wright said that in the future, he can see "people going in as entertainment designers, not game designers, or film directors, or TV producers." David Yager, dean of the UC Santa Cruz Arts Division, pointed to his work with doctors at Johns Hopkins as an example of what interdisciplinary work can bring to the table. "My value in a hospital is that I'm not a physician," Yager said. "With the way I see things, I'm able to convey a very different point of view."